This isn't technically from my workshop, but I do like playing with food and every now and then I come across something that has results so much in excess of the effort that goes into it I have to share. These candies are adorkable and easy to make. I saw a photo once of the same idea and made my own. Here's how! Break the white chocolate up into small pieces, put into a bowl, and heat up gently in the microwave about 5 seconds at a time. Stir it around every 5 seconds so you get a feel for it. Microwave it just enough that the pieces are getting a little melty but there is still a lot of solid pieces. Stop microwaving it at this time. Stir constantly, the residual heat will continue to melt the solid parts of the chocolate. Stir until it's all melted together. Microwave it another few seconds at a time if you really need to, but keep in mind you don't want to heat it any more than you have to. Put a small dollop on some parchment paper and flatten it a bit. 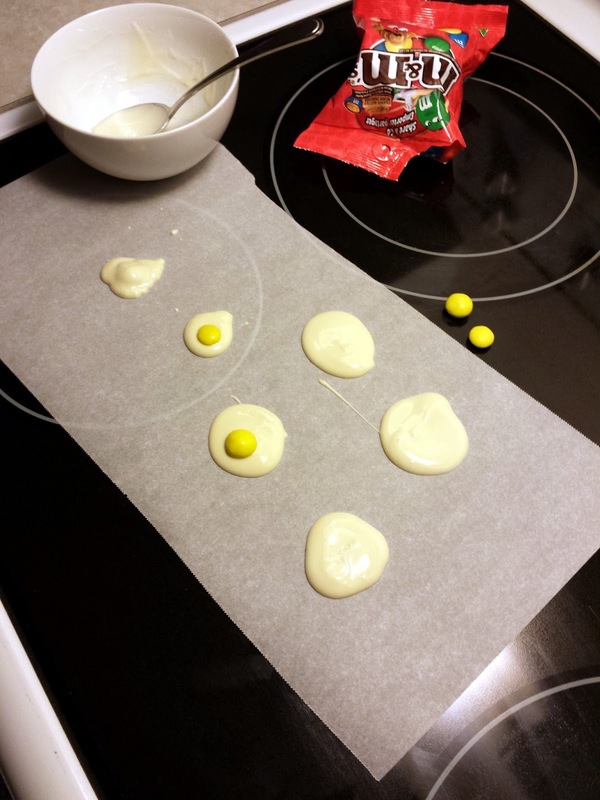 Put a yellow M&M in the melted white chocolate puddle a little off-center. Put your finger on top of it and give the M&M a little circular rocking motion of a twirl. 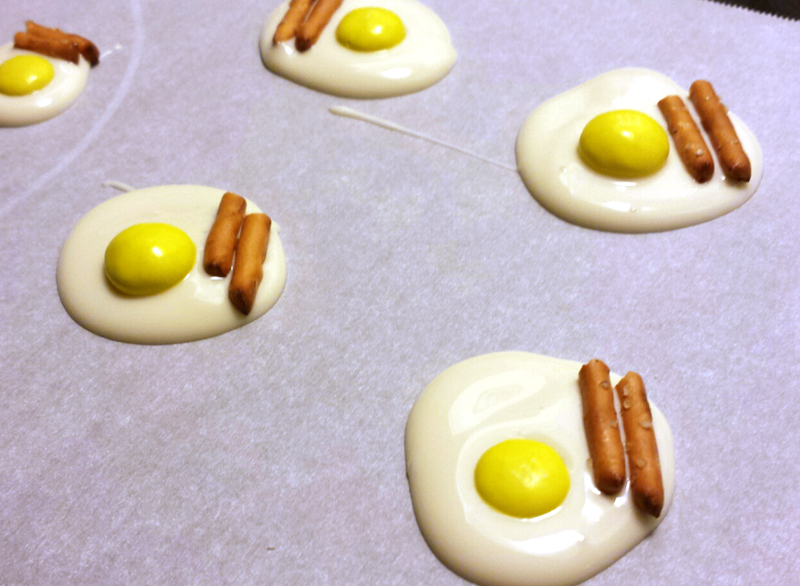 This will stick some white chocolate to the sides and make it look more like it's a yolk that is attached to the white. 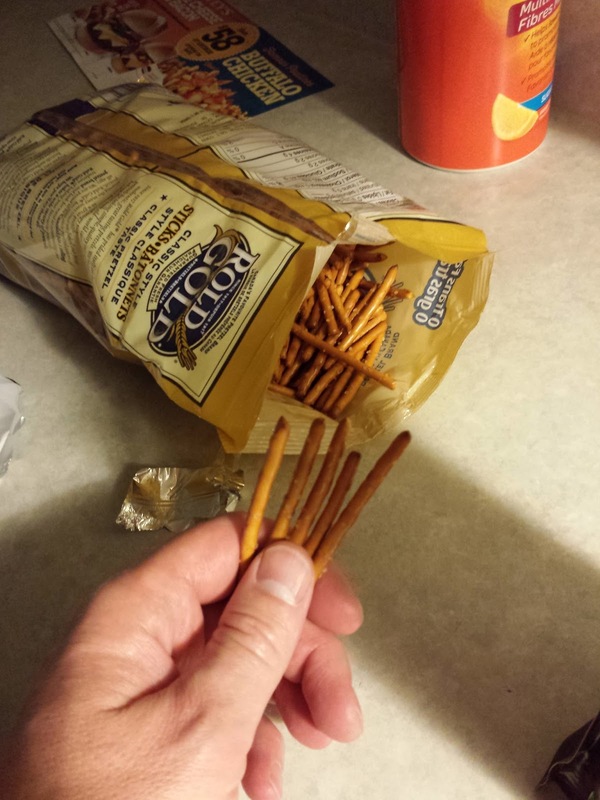 Now break two small pieces of pretzel. Lay them on the chocolate. 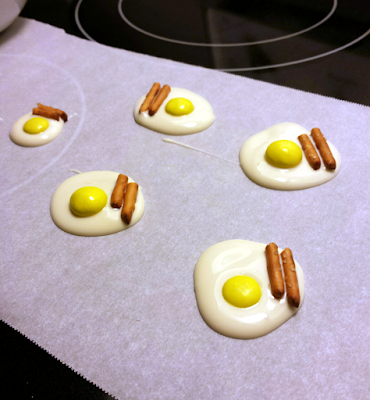 Leave them until they cool (or stick them in the fridge if you're impatient) and enjoy your adorkable little candy sausage & eggs!